Entry No. 257, Saintpaulia ionantha ssp. grotei 'Silvert', exhibited by Karyn Cichocki. I was enamored seeing this plant at the show. I thought: What was that curious looking natural thing the plant was growing from? I had been thinking about growing AV species for some time, something pure. So when I saw a small AV species for sale at our local show, grown by one of our members, I snatched it up, that was in June 2010. I repotted it from a 2 to 4 inch pot in August 2010, and now it needs to be potted up to a 5 inch. It is S. rupicola, and it is doing great. Maybe I can post a photo of it here. In any event, does anyone know what material that plant was growing in? I would like to try that. Yours in growing, Bev N.
Several years ago I purchased a Jankaea from a rock garden plant supplier and it came growing in a piece of Tufa rock. The plant died but I kept the rock. This is a very light weight rock that has lots of rough areas in it and it is quite easy to either drill or hammer out a hole in it. After seeing a presentation on Saintpaulia species and that they grow on rocks, I decided to try growing one in the Tufa rock (http://en.wikipedia.org/wiki/Tufa) and chose the grotei ‘Silvert’ because it has a natural trailing habit and is fairly small growing. I enlarged the hole that was already in the rock from the Alpine plant, then planted the violet in it. I keep the rock sitting in perlite that I have in a Oyama pot so that it stays moist and the rock absorbs the moisture from the perlite. I can’t believe that the roots manage to grow all the way through the rock and come out the bottom. The plant really likes it. As for the soil, I used my usual mix which is 1 part peat moss, 1 part each of course perlite & vermiculite. Because the hole isn’t all that big, 3” deep and about 1.5” wide, there isn’t much soil in it. When I show the plant, I take the rock out of the Oyama pot, clean the perlite off it and then set it in a green saucer. 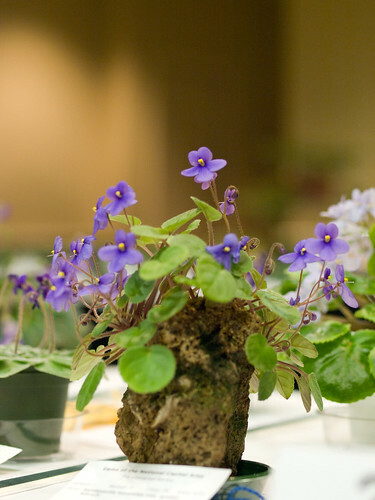 I’ve attached a picture of it in the Oyama pot.